Samford University emphasizes its mission by encouraging community service as an extension of classroom learning for students. 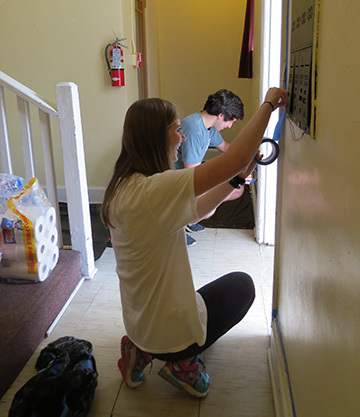 That was reinforced when 15 Samford students used their recent spring break for a special project in Mobile, Alabama. The students traveled to L’Arche Mobile to participate in a spring break service immersion trip coordinated by Samford’s Frances Marlin Mann Center for Ethics and Leadership and the Micah Fellows honors program. L’Arche Mobile, an international federation of communities in more than 35 countries worldwide, is a place where people with and without intellectual disabilities live, work and share their lives together. Over the course of the week, Samford students worked alongside undergraduate and graduate students from Saint Louis University and Eastern Illinois University to assist and learn from a variety of Mobile nonprofits across the city, including project work at Feeding the Gulf Coast Food Bank; helping L’Arche members with equine therapy; deep cleaning and painting the interiors of three homes where L’Arche members live; working at a garden center; and completing maintenance projects at Central Presbyterian Church. Allison Nanni, Samford’s director of community engagement, plans service immersion trips through the Mann Center. Nanni explained that the purpose of the Mann Center spring break trips was not only to briefly provide key organizations with volunteers, but to increase students’ awareness of specific social issues by giving them the chance to get close to those who are suffering in some way. Nanni explained why the Mann Center was attracted to a partnership with L’Arche Mobile in particular. “Nonprofit leaders [like those at L’Arche] and the people with whom they choose to share their lives have a lot to teach us about putting our faith in action,” she said. Bridget Mulroy, home life leader for L’Arche Mobile, is one of those inspiring leaders. Mulroy coordinates the organization’s interaction with the greater community, including partnerships with volunteer groups, universities and other nonprofits. In addition, she works to enhance the quality of life for core members, which include traditions, celebrations, prayer, communication between members and conflict resolution. Mulroy, a Mobile native, began working at L’Arche when she was 18. Twelve years later, Mulroy has no doubt that L’Arche is exactly where she needs to be. Thirteen of the 15 students who spent the week at L’Arche Mobile were members of the inaugural class of Samford’s Micah Fellows program. Ashley Layman, a freshman biochemistry major, appreciated the way L’Arche connected with other organizations in the community. Emanuel Poulos, a sophomore sports medicine major, was impressed with the warmth and generosity of the L’Arche members. Nanni is confident that many students who participated in the Mann Center spring break trip to L’Arche Mobile will make a sustained commitment to community work after returning to campus. “Getting a weeklong glimpse of how L’Arche intentionally works to make known the gifts of vulnerable people was a powerful example for all of us, not only of how be more inclusive, but also how to honor our responsibility to create a more just and equitable society,” she said.